Cave drawings dating back to 15,000 years ago may represent more than just animals — they may be an indication that these prehistoric people were keeping track of the stars. A depiction of aurochs, horses, and deer. Image via Wikipedia. When 18-year-old Marcel Ravidat discovered the cave of Lascaux, in southern France, he was thrilled. He asked a couple of his friends to join in exploring the cave, and they discovered a stunning set of drawings on the cave’s walls. It didn’t take long for researchers to find out about the cave and realize how remarkable it is, and a myriad of studies have been carried out since. Overall, there are more than 600 paintings on the walls and roof, most of which depict large animals — typical local and contemporary fauna. The drawings are the combined effort of many generations and have been dated to about 17,000 years ago. But the cave paintings may hold even more surprises. According to a new study, they may be more than just visual representations — akin to a horoscope, they may be a stylized representation of star alignments. It’s not the first time someone has tried to explain the significance of these cave drawings. 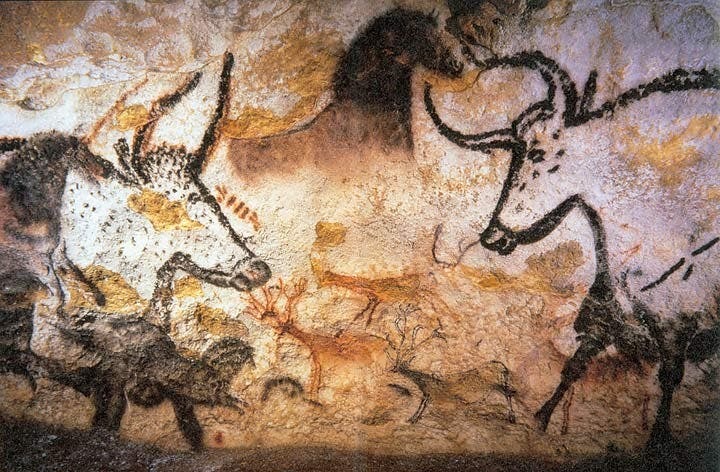 Aside from the more common depictions of horses and aurochs, a few drawings are quite puzzling. For instance, one shows a human figure angled next to an auroch, the beast’s intestines dangling from its belly. Next to it, a duck-like figure stands next to a rhinoceros (perhaps a Siberian unicorn). Of course, a superficial (but quite possibly true) explanation can be ascribed to these drawings: they could represent stylized scenes that the artists may have witnessed, or perhaps deities or spirits — as caves were possibly considered as supernatural places. They may have been prayers, or a form of an ancient wish list, invoking the favor of forgotten gods. Still, not all researchers are convinced this is the case. “Early cave art shows that people had advanced knowledge of the night sky within the last Ice Age,” says one of the study’s authors, chemical engineer Martin Sweatman from the University of Edinburgh. “Intellectually, they were hardly any different to us today,” says Sweatman. Sweatman and his colleague from the University of Kent, Alistair Coombs, say we should give these ancient people a bit more credit. The two believe that these animal symbols could represent star constellations in the night sky (much like the signs of a zodiac) and were used to represent dates and mark astronomic events such as comet strikes. Even more, they argue, this shows that as far back as 40,000 years ago, humans kept track of time using knowledge of how the position of the stars slowly changes over thousands of years. Based on their analysis, the date could be estimated within 250 years — hardly an accurate technique, but it still shows that the astronomical capabilities of the cave’s inhabitants were far greater than initially thought. Furthermore, researchers explain, this would mean that ancient people understood (or at least were able to observe) an effect caused by the gradual shift of Earth’s rotational axis, something called precession of the equinoxes. Previously, it was thought that the Ancient Greeks first discovered this phenomenon. Essentially, this process is a slow, and continuous change in the orientation of the Earth’s rotation axis, in a cycle of approximately 25,772 years. This movement means that if you look at the night sky a few hundred years from now, stars will appear shifted. Precession of Earth’s axis around the north ecliptical pole. Image credits: Tauʻolunga. This might not be the only ancient site that employed this practice. Göbekli Tepe, an archaeological site in the Southeastern Anatolia Region of Turkey, and Çatalhöyük, a very large Neolithic proto-city settlement also in Turkey, “display the same method for recording dates based on the precession of the equinoxes, with animal symbols representing an ancient zodiac,” researchers write in the study. The theory of coherent catastrophism is still controversial, suggesting that the Earth has been regularly subjected to catastrophes from passing comets. But Sweatman and Coombs say that if their interpretation is correct, everything fits — the date of a comet impact recorded in the drawings at Lascaux fits with what separate data suggests. “The date of the likely comet strike recorded at Lascaux is 15,150 BC to within 200 years, corresponding closely to the onset of a climate event recorded in a Greenland ice core,” they continue. A survey of radiocarbon dates of other Palaeolithic caves is consistent with this zodiacal interpretation, the authors say, giving their interpretation a strong statistical relevance. Finally, the 40,000-year-old carving of an upright lion found in the Hohlenstein cave is also consistent with their interpretation, indicating that this practice may have been not only ancient, but very widespread. The fact that all these different geographical areas employed a similar approach can “revolutionise how prehistoric populations” are seen, Sweatman concludes. Of course, this is a bit speculative at this point. No doubt, researchers will continue to debate the meaning of the cave paintings for years to come, but it’s an interesting interpretation, one that shifts away from the common shamanistic idea. At the very least, it’s an interesting hypothesis worth exploring in future research. This study was published in the Athens Journal of History.